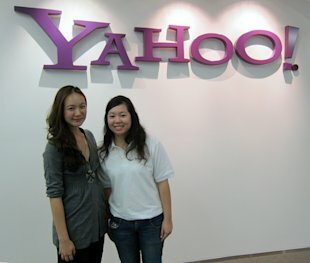 The staff of Yahoo! Southeast Asia had a pleasant surprise on Friday evening when National Solidarity Party's Nicole Seah dropped by for a visit at its Anson Road office in Singapore. The 24-year-old Marine Parade GRC candidate in the recent General Elections chatted with Yahoo! employees and obliged requests for photographs before we sat her down for a one-on-one chat. In the first of a three-part series, she answers questions posed by Yahoo! Singapore's Facebook and Twitter followers. @shmarv: If you could change one thing (about your campaign), what would it be and why? This is a very good question. It's something that a lot of people have asked me and even I myself constantly question myself post-elections on whether there would be anything I would change. But I think even for any slip-up or any mistakes or good thing came out of it, I don't think I would have changed (any) thing because it really has contributed to teaching the lessons I've learned this GE and to shape me as a person. So I wouldn't change a thing. @ist1096: What is it like being a celebrity now and how will you sustain your zest and passion to be able to last the next 5 years? I still feel very uncomfortable with the term "celebrity" because I don't see myself as one. I've always seen myself as a very average Singaporean who would probably have remained very average if I didn't step up this time round. So when people come up to me and say "you're a celebrity now", I just get very taken aback and I feel very like, "please don't say that" (because) I really am not a (celebrity) and I'm just like everyone else. It's just something that the media has played up. Because of my profile, it has really made me sort of like an unofficial ambassador to speak up on behalf of the less fortunate in the society or the middle class Singaporeans who are being squeezed. So I think that this is something that I will continue to do as I go down the road. With regards to how I'm going to maintain this, I think even when I came into opposition politics from the outset, I knew that this was going to be a lifelong battle that I'll be facing but as to how I will fight it, I really don't know yet. But at this point, I see that there is a role for me to play, and I will continue playing it for the next five years. @badboytiar and @pyeongg: Are you going to leave NSP and join another party? A lot of people have asked me this question too but for me, number one, I believe in a multi-party system so I do see the potential of staying in NSP. Another thing is that the NSP has potential. It might not be polished but I see it as a bit of "a diamond in the rough". I think that it does need a bit of polishing; it does need a bit of change and new direction. I think that I want to be part of that process. I don't want to jump into something that will give me the best and most established platform but I would want to be that person to form that platform. @polalion: What are your plans to raise your profile over the next five years? How would you make use of your significant presence in social media? I think the key to maintaining presence on social media is really to constantly engage with the people who visit your page. I think one way to do that is to continue asking them questions that make them think and continue (to provide) content that touches their heart or makes them really think very deeply on how they can play a role in the society. So I think if I can provide that, people will come back and continue to see what I have to say as a politician. So for me, the key is really engagement. With regards to using my presence in social media, I want to use it to help people to reach out to people. For a start, there are a lot of organisations out there, some that are really in dire need of help, some that are not so high profile and they are trying to raise funds for the families that need the most. I think these are the organisations that are struggling to get by. So as time goes by, I don't want to spam my supporter base but I do want to keep pushing out such events and information, to let them know that there's such a problem and concern in Singapore and let them know that "you can step in to help if you want to. All it takes is the click of a button or make an effort to go down to the event and play a part." I think that would be a good start. Hydar Saharudin: Are you going to Pink Dot 2011? Yes I am! I'm definitely a supporter for the Pink Dot movement. I think for the past two years, I've always wanted to go but I really couldn't go because I just happen to be out of the country or holidaying. So this time round, I don't have anymore leave to clear because of GE so I will definitely be in Singapore and I'll definitely be there. Ding Neng: Does your boyfriend feel any pressure with you suddenly becoming so famous? Not at all. He's been very unaffected by this. In fact, he is the most unaffected by all these attention. I think they even have a forum thread talking about him and how cute he is and I think he secretly likes it but that's just me. I think he's okay with it. No reaction. Yahoo! Singapore also put Nicole through a "quick-fire" fun quiz that saw the lighter side of the witty 24-year-old. Star Wars! I'm such a Star Wars geek and I caught all six episodes and I think when they added "Revenge of the Sith", I felt very sad going into the cinema because I knew that it was going to be the last episode ever and when it ended, I felt like crying and I felt lost and really depressed after that. Where's your favourite hangout and why? My void deck. I lepak. I chill. I talk to my brother. It's just a quiet zone for me because the area where I stay in Tampines is really desolated so late at night, it's very quiet and cool. There are very few cars passing by. So when I need to clear my mind, I will just sit at the void deck and I'll stone for a very long while. Technically I don't play sports because I have two left feet and I cannot coordinate and my motor skills are a bit "out of whack". If I had to choose, I do yoga. (Pauses) Sleeping... I don't get enough of that. So in my free time, I sleep. I don't even do any of that nowadays. (Long pause) I like to shop for snacks. So what I do is that I'll go around shopping for snacks. Somehow I don't really eat them and I end up giving them away. I just like to eat, buy food, eat food. Eating is my hobby. On a party level I'd say orange but on a personal level, I would say black. I'm always in black. I favour black pens over blue pens. It's an understated colour and it's neutral. I like neutral colours. What are your dream qualities in your man? I need someone who is an intellectual equal, if not more and my boyfriend is more intellectual than me so I guess that's a good fit. I like someone who can make me laugh and can make me feel secure. And someone who can tolerate my mood swings and believe me, they got really bad during the hustings. For comfort food, I like Teochew Muey (porridge) with cai xim (preserved vegetables). The other one is ayam buah keluah. I like to dig into the nut and eat the black stuff. It makes me happy. It's very tasty. Hey, guys who are interested in Nicole, do you fit the bill to be her boyfriend?